How exciting can a film based on a textbook be? If the textbook’s about all manner of magical creatures, pretty exciting. It is 1926 and magizoologist Newt Scamander (Redmayne), future author of the textbook Fantastic Beasts and Where to Find Them, arrives in New York. 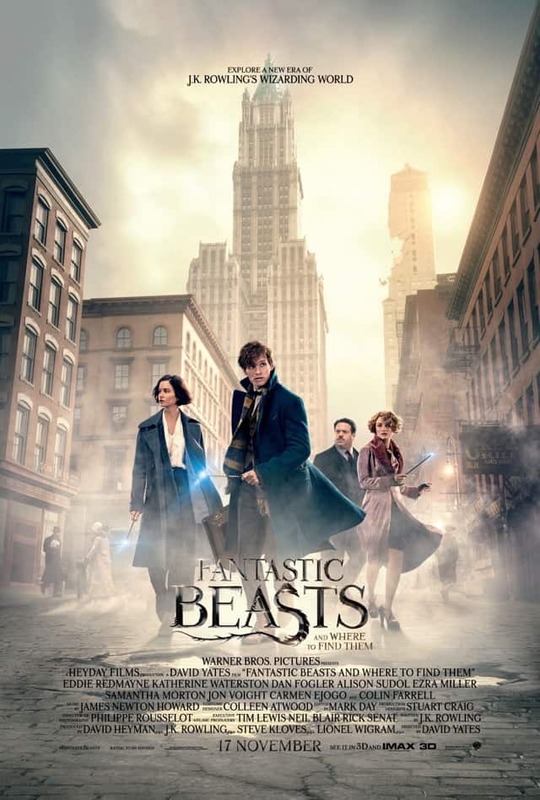 When several animals escape from his briefcase, Newt runs afoul of the Magical Congress of the United States of America (MACUSA), headed by President Seraphina Picquery (Ejogo). MACUSA’s director of security Percival Graves (Farrell) is tasked with capturing Newt. Porpentina ‘Tina’ Goldstein (Waterston), a former MACUSA agent, aids Newt in tracking the creatures down. Jacob Kowalski (Fogler), a non-magic user or No-Maj, is inadvertently drawn into the fray, and falls for Tina’s telepathic sister Queenie (Sudol). In the meantime, anti-wizard sentiment in the U.S. is mounting, with the New Salem Preservation Society (NSPS) gaining ground. The hate group is led by Mary Lou Barebone (Morton), whose adopted son Credence (Miller) bears the brunt of her abuse. Mary Lou petitions newspaper magnate Henry Shaw Sr. (Voight) for his support of the NSPS. Henry’s son Henry Shaw Jr. (Josh Cowdery), a U.S. senator, is attacked at a rally by an Obscurus, a sinister parasitic entity. As the wizarding world is under threat from all sides, Newt and his newfound allies must restore order to a city flung into mayhem. This spin-off of the Harry Potter franchise is intended to expand the film series into a cinematic universe known as the Wizarding World. While we’ve all grown wary of cash-grab franchise extensions, there’s no rule that says they must be devoid of artistic merit. Director David Yates and screenwriter J.K. Rowling are no strangers to the Potterverse – he directed the last four instalments in the series and, well, she created the whole thing. It is a savvy move to make Fantastic Beasts a period piece, giving it a markedly different setting from the Potter films with which we’re familiar. Instead of being a direct prequel, it’s mostly removed from the narrative of the boy wizard and his family history, meaning this serves as an ideal jumping-on point for neophytes and younger viewers who didn’t grow up with the Potter books or films. The world-building on display in Fantastic Beasts is meticulous, benefitting from Rowling’s detail-oriented tendencies. Newt experiences some culture shock, and there are little touches which demonstrate how the Brits and Americans do things differently. For example, non-magic users are called ‘Muggles’ in the U.K., but are referred to as ‘No-Majs’ across the pond. The ’20s New York setting, just before the onset of the Great Depression, is well-realised and immersive. There’s a scene set in a wizard speakeasy and an action set-piece set in the Central Park zoo. We watched the film in IMAX 3D, and the stereoscopic effects are satisfyingly plentiful. James Newton Howard’s score envelops the viewer, and there’s some playful jazz weaved in. The titular beasts are plenty of fun, and spectacle isn’t in short supply here. The Niffler, part-badger, part-pangolin and all kleptomaniac, is an adorable mischief-maker. The rhinoceros-esque Erumpent sets the stage for an inspired moment of physical comedy, and Newt has his own Baby Groot in the form of a shy plant-like creature called the Bowtruckle. Newt’s struggles in wrangling the creatures are entertaining, and many of his interactions with the animals are endearing. The visual effects, supervised by Tim Burke and Christian Manz, are extensive and generally impressive. However, this reviewer would like to have seen more practical animatronic creatures mixed in with the computer-generated ones. While Yates does a fine job, we couldn’t help imagining what a director like Guillermo del Toro would’ve created. Rowling alludes to the classic film Citizen Kane with Voight’s newspaper-owner character and his senator son. Unfortunately, this subplot is under-developed and doesn’t sit cohesively enough with the main plot of Newt’s adventures. The NSPS, with its cult-like nature and cruel matron, is clearly Rowling’s reaction to the religious groups who called for boycotts of the Potter books and films because of their supposedly Satanic content. Newt mentions how he finds the MACUSA’s laws against marrying or even befriending No-Majs to be retrograde. While we appreciate the social commentary and the attempts to give this whimsical fantasy some real-world grounding, it’s not particularly subtle. Redmayne is a wonderful fit for this franchise. He seems most at home in period films, and it’s easy to buy him as a tweedy, earnest academic. Redmayne also proves adept at acting against things that aren’t there. As a markedly different type of female lead than Emma Watson’s Hermione Granger, Waterston turns in an appealing, low-key performance. Sudol gets to ham it up a little as the coquettish flapper. Fogler has been a low-rent Jack Black or Seth Rogen for much of his career, but this reviewer enjoyed him as the comic relief sidekick/audience-identification character. While the Harry Potter franchise boasts an abundance of colourful supporting characters, those in Fantastic Beasts don’t quite measure up. Farrell’s Graves is the Inspector Javert-type, not unlike his character in Minority Report. There’s a bit of a spin put on things, but perhaps it should’ve been played with more panache. Miller’s Credence is meant to be at once sympathetic and creepy, which he does fine. Ejogo’s Picquery is the equivalent of a police chief on a procedural show, and Voight is woefully underused. Fantastic Beasts has enough to offer fans who span the spectrum from ‘this is kinda interesting’ to ‘legally changed my name to Severus Snape’. While its story isn’t spectacularly riveting and its social commentary is on the nose, it features likeable lead characters and entertaining spectacle. At 133 minutes though, it is about 15 minutes too long and lapses into multiple endings. It has been announced that there will be five films in the series, but thankfully, this Fantastic Beasts doesn’t do an obnoxious amount of sequel-baiting. Keep out for a certain A-lister as a certain key player in Potter lore. Summary: This new chapter in the Wizarding World caters to devotees and newcomers alike, even if the setting is more interesting than the story itself.